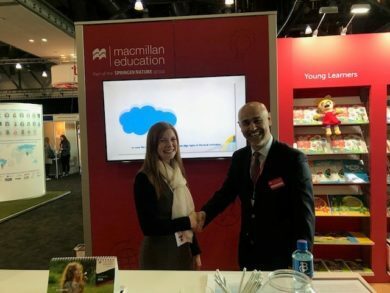 Eaquals and Macmillan are pleased to announce that they have signed a Memorandum of Understanding (MOU) at the recent IATEFL Conference 1-5th April. Eaquals Executive Director, Lou McLaughlin with Head of Macmillan Education Southern Europe, Erdem Hacifazlioglu at IATEFL 2019 in Liverpool. Eaquals Executive Director, Lou McLaughlin, said “Eaquals is delighted to develop this relationship with Macmillan in Turkey as Macmillan have long been as Associate Member of Eaquals. We are keen to work jointly in raising awareness with regard to accreditation and quality assurance, areas that are of importance to our Associate Members”. Head of Macmillan Education Southern Europe, Erdem Hacifazlioglu said “We are very happy to start this relationship to search the grounds of making a positive impact on English Language Learning and Teaching across Turkey and Cyprus by developing a solution with the excellent content developed by Macmillan Education and the expertise EAQUALS have regarding the development of quality standards , delivering accreditation against these standards for schools, universities and other ELT institutions and developing practical resources, and offer training and support for those working in the field of modern languages” .